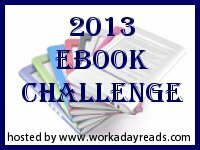 E-Book Reading Challenge ~ Love.Life.Read. I’m a librarian so I never will stop reading printed materials but I have reading on a Nook for years now. I recently have gotten an iPad so I now read on it. I find it especially convenient when I am traveling. I remember going on vacations prior and my husband complaining about the number of books I packed. LOL Now I can take just as many books and have them all on one device. Because this challenge allows you to move up (but not down) levels, I am planning conservatively to start.